This December I am excited to be participating in “Cans for Comments” (props to photographers Chris+Lynn for coming up with the idea!). What is this? Here’s how it works! For every blog comment on ANY post, I will donate 2 cans or items of non-perishable food to the Abbotsford Food Bank for the entire month of December. At the end of the month, I will go shopping and take a photo of all the food we have collected! Feel free to share this around and comment as often as you like! Great, Alyssa! I hope you get lots! awesome! we’re participating too. cute photo! :) I’m totally gonna do this too! Just gotta find a picture & blog about it! Such a good idea. What a splendid idea! Hopefully you’ve got deep pockets because I plan on checking out every post! That’s a really awesome idea, and a great way to give back! Who did your website step up? Cute pic!!! :) Happy holidays! @Arlen, I setup my site myself with a self-hosted wordpress blog and a ProPhoto customizable template. Such adorable photos! I love the one in the car! So romantic! 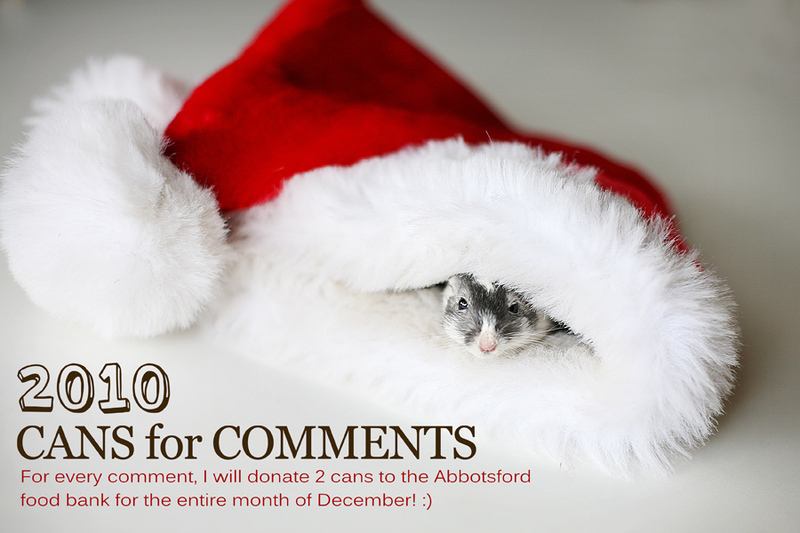 I am doing cans for comments too and also donating to the Abbotsford Food Bank! Yay!